With artists, authors, newspaper scribes and photographers going back two centuries in my family, it's no surprise that we have a family tradition of "over the top" Christmas letters. This is my latest version from 2004 created in Adobe inDesign and Illustrator. To keep the file size small enough for dial-up I've had to severely compress the images in the file. 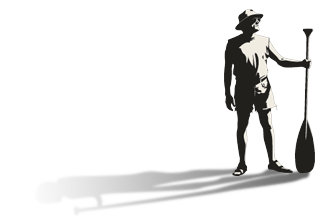 They can be found at higher resolution elsewhere on this site. For Christmas presents this year I built a complete calendar in Adobe inDesign. Each month features one of my paintings on the top page while the bottom page has a little peek-a-boo images of the upcoming month's painting. 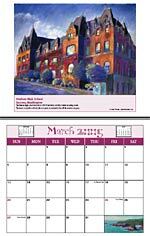 The month featured in this PDF uses the first of three paintings I've done of Stadium High School in Tacoma. This was a fascinating project and a great learning experience, taking me about 3 days during the holiday break. I printed a few on my inkjet printer using double sided glossy, but realized quickly that 26 pages of full color per calendar was simply too much work for an inkjet photo printer. I took the file down to my old boss at J & D Printing in Tacoma where they were able to print them quickly on a high end laser printer at an affordable price point.